Protective Stylers rejoice! 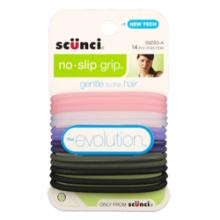 The Scünci Evolution creates healthier ponytails. Some of the things we have to be aware of along our hair journey are the little opportunities to make seemingly small improvements that make a big impact on the health of our hair. Today I'm here to talk about one of those "small improvements." Specifically, instead of a product or technique, I want to rave about my newest hair accessory. Ladies, let me introduce you to the newest technology in the area of hair elastics. Remember the old days where ponytail holders were secured together with the help of a metal fastener. Back then, some of these elastics were even rigged in their design. Some of you who've experienced these types of accessories know the ridges and metal fastener are breakage opportunities waiting to happen. Then the makers of these accessories began to get smart about their design. The next level of greatness in the world of hair bands came in the form of the Ouchless band. I can still remember the day I first laid my eyes on the Ouchless bands. They were smooth all the way around without even so much as a hint of any damaging metal or snag-attracting ridges. As soon as I seen them, I knew they'd be a perfect addition to my hair product and accessory stash. These newer bands worked really well for a while but I noticed that as time passed, the band would begin to stretch with overuse, and this would begin to happen. The elastic could become exposed creating yet another opportunity for hair snagging to occur. Another flaw in the design of this band was the cloth-like material. Whether I realized it or not, every time I put my hair up in a ponytail using one of these hand bands, it would be absorbing the Gleau I applied little by little. Could the continuous absorption of product from the same area on a consistent basis be the culprit to the longer broken hairs I experienced from time to time? This and other worries are no more because on my trip to Target the other day, I stumbled upon the latest technology in elastic hair bands. Ladies, meet the Scünci Evolution. The Evelotion is the solution to all the minor inconveniences to modern day ponytail holders. This baby is made up of a 100% gel like material with no breaks in the design for potential snags. Best of all, the gel material is completely smooth all the way around and won't absorb any product away from my hair. The new design also seems to be made up of a more durable material that won't lose it's shape even after consistent usage. You protective stylers will love this. I picked these up for around $3.50. This has now become an item that I'm strongly recommending to you as a part of the continuous improvements to your hair journey. When I think of the possibilities of this upgrade long-term, I see healthier pony tails and less breakage over time. I'm currently on a temporary assignment that will last for several weeks. During this assignment, I have to wear my hair in away from my face on a daily basis. I can breathe a sigh of relief now that these bands have come into my possession. So why not look for these on your next trip to Target or Walgreens. You'll be glad you did. I adore these. They never stretch out. Wow, thanks so much for this info! I will definitely go pick some up. I love your blog! @ Tay- My experience so far with these have been fantastic. The bands just seem to slide out with the greatest of ease yet they stay put when they need to. Of course I still need to exercise caution whenever removing any accessory from my hair but these by far have been the most hair friendly hair bands I've tried to date.